Evidence of cloth being made dates back from 7000 to 8000 BC in Mesopotamia and in Turkey . At that time wool was considered crude, linen was thought to be of the highest quality. Historically weaving was done primarily by men, in the 1600's, women married or single were referred to as spinsters because they were responsible for dying and spinning the fibers needed. The first cloth made in America was linen made using flax that grew well from seeds brought by the new colonists. It took many years until enough sheep were imported to make wool in sufficient quantities. Early villages and towns had professional weavers who turned home spun yarns into cloth. Later traveling weavers worked the housewives saved thread into yard wide material. In isolated areas many made the complete product from start to finish themselves. Floor looms took up much needed space, weaving was usually done in a loft or in a separate building called a loom house. The first organized group of women called The Daughters of Liberty, were recognized as patriotic heroines. In 1766 their efforts helped end the Stamp Act and openly apposed the Tea Act in 1774. They were determined to make Americans less dependent on England by creating goods that were being imported. This lead to new American made fabrics called "homespun", from short course fibers for utilitarian use. And linsey-woolsey, a more comfortable material for clothing that used flax as a weft thread, or base, because of its strength and cotton as a warp, or the weaving material for clothing. Young colonial girls learned the craft of weaving on small lap looms. The beginners made a simple linen tape. By age 6 or 7, they were experienced enough to make shoe laces, belts, suspenders and hat bands or "ribands", for decorative trim. Intricately patterned silk or woolen braids were made by adult women as sewing notions for household decorating and to trim clothing. The looms were often taken along on social visits. The hand loom in our kit is easily portable and great for small hands, as well as being easy to use by all. A shuttle is included to carry yarn for weaving, along with extra weaving material. 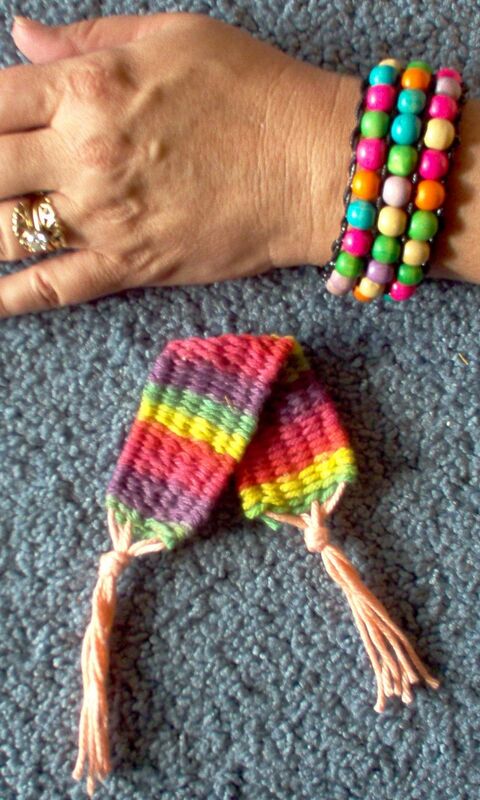 Bookmarks and bracelets are a quick and easy project. Strips can be sewn together for many more uses. Beading projects can be made by adding beads and using a needle with an eye small enough to fit through holes. Large diameter seed and pony beads make beautiful bracelets.